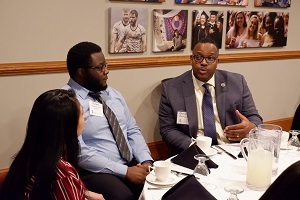 Three Mount alumni, all from different career fields yet each living significantly, offered advice to nearly 30 students at the inaugural Alumni of Color Panel dinner on January 25. Jasmine Duke, C’13, human capital analyst at Lockheed Martin; Gonzales Wesley, C’90, owner of WGI 3-D Marketing & Media; and Gracelyn McDermott, C’93, executive director of Kaiser Permanente, shared their Mount experience as well as advice on career and personal success. The dinner was hosted by the President’s Advisory Council for Diversity, Equity, and Inclusion and organized by Vice President for Equity and Success Paula Whetsel-Ribeau, Ph.D., Assistant Director of the Center for Student Diversity Stephanie Durr and Dominique White, C'21. Jasmine Duke, a psychology major, Third Century Scholar and president of the Black Student Union during her time at the Mount, offered advice on trusting yourself and not expecting success to happen overnight. She urged college students to take advantage of opportunities that arise; often students think if an internship or other opportunity doesn’t pertain to their major, they can’t do it. Duke stated the opposite, stressing that a major is just what you’re studying in school, not a box to stay in forever. She recommended that students seek a career path based on what they enjoy doing so much that they would do it without getting paid. "No one is you and that is your power," said Duke in emphasizing that everyone has unique skills and talents, and students must be confident in themselves to be able to succeed. Gonzales Wesley, who earned a bachelor of science degree in accounting, business and finance, was a resident assistant, ROTC cadet, and member of the Black Student Union. Since he graduated, Wesley has worked as a combat engineer for the National Guard and now owns a marketing company. Wesley talked about the balance between work and fun, something many adults struggle with in their day-to-day lives. "Don’t put aside the things you like to do for the things you have to do," he advised, noting that when work life coincides with the things you enjoy doing, you never look at your job as something dreadful and you look forward to waking up each morning. Lastly, Wesley mentioned the importance of friendships and cultivating conversation. Talk to people who sit on the other side of the classroom who you think you have absolutely nothing in common with; that person may end up becoming a friend you’ll keep forever or someone who can help you with a job in the future, Wesley said. Gracelyn McDermott, who majored in international studies and Spanish and now serves as secretary of the university’s board of trustees, talked about the importance of networking. Throughout her professional career she was sought after because she took the time to talk to everyone, thus making a name for herself. Her communication skills made her so attractive to companies that she’s had positions offered to her that employers have created especially for her. Like Duke, she emphasized the importance of trying new things. While her wok is unrelated to her majors in college, at the Mount she learned the skills that help her in her day-to-day work. As she put it, she was hired for what employers saw she could do, not because of her experience. Dr. Whetsel-Ribeau stated that this dinner was the first of many to come. I’m truly looking forward to next year’s event and to hearing what a new set of panelists has to offer. It was inspiring to hear the stories of people who were once in my shoes and how the Mount has changed so much since then. Over the last 30 years, the Mount has jumped from 6 percent to 38 percent minority enrollment, allowing for the university to grow and embrace changes prompted by diversity and for a diverse group of people to experience all the university has to offer.